Starring the voice talent's of Joy Nash from AMC's “Dietland”! On the night of Friday, October 16th, 1931, Winnie Ruth Judd had a fight with her two best friends that ended in a double fatality. Two nights later, she boarded a train headed for LA, with grisly baggage that contained the bodies---one dismembered---of her former friends. When the trunks were found to be leaking blood upon arrival, Winnie was asked to open them. Claiming she forgot the key, she walked out of the station and disappeared into thin air. One week later, she surrendered in a funeral parlor, a bullet lodged in her left hand, claiming the women attacked her and that she had only shot in self defense. Oddly enough, some of the physical evidence seemed to support this story. However, instead of getting simpler the story got weirder and wilder as more became known (or unknown, depending on whose version you chose to believe), involving adultery, narcotics, mental illness, secrets and whispers of a conspiracy. To this day, the truth remains a mystery. 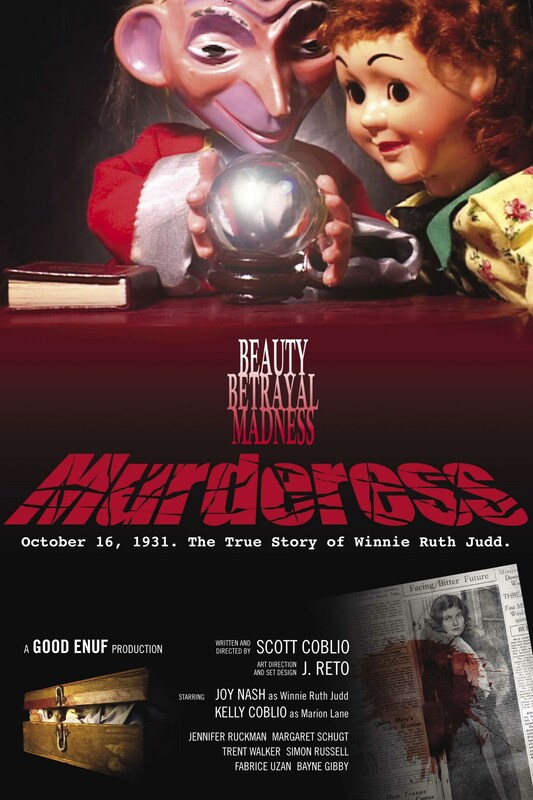 "Murderess'" was the brainchild of writer/director Scott Coblio, a Los Angeles native. The film was shot on miniDV tape and took 3 years to complete. It debuted at Rochester New York's Little Theater as the anchor-piece of the "Image Out" Film Festival, where it garnered positive reviews from the local press. In 2008, the film won the Best Animated Feature award in Los Angeles at the DIY Film Fest. Screening the film annually on (or near) October 16th (the night of the murders) has become a tradition at the Trunk Space, and this year's screening marks the 12th anniversary of that tradition.